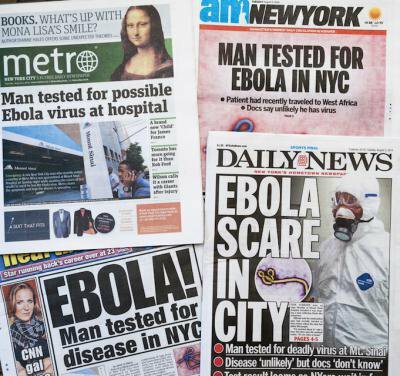 Fears of Ebola spread to the US. Will this finally galvanize action to find a (affordable) cure for the virus? Demotix/Richard Levine. All rights reserved. The current focus of public attention is on the unprecedented west African outbreak of Ebola, a virulent disease with a high mortality rate that can be accompanied by the almost complete breakdown of normal bodily functions, as well as by extreme incontinence and bleeding from all orifices. A horrific way of dying. Of the five types of Ebola, the currently active Zaire Ebolavirus is the most aggressive and lethal, with an extremely high mortality rate up to about 90%. But mass media are not asking possibly the most fundamental question about Ebola–given that Ebola has been known to the international health community since 1976 (featuring in about 34 outbreaks), why was a vaccine not developed long ago? The answer lies in the unwillingness of western pharmaceutical companies wedded to high profits to consider the undoubtedly costly investment in vaccines and treatments for infectious diseases that are rampant in the poorest countries of the world, mostly in Africa. The speed and unpredictability of the current outbreak has confronted the world with the fearsome possibility that this disease could even spread to the US and the west. As soon as Ebola was perceived to be no longer confined to Africa, the world–which has until now turned its back on Ebola and a number of other tropical infectious diseases–was galvanized into action. There is a significant risk that the mythical global village might become an uncomfortable reality. The present head of the World Bank, whose professional life began with handling an infectious disease outbreak in Haiti, has announced that the World Bank will donate $200 million to an Ebola fund to be administered by the World Health Organisation (WHO). The WHO has set itself a target of $100 million, of which only $30 million has so far been contributed by its member states. Until recently, this Ebola outbreak was concentrated in Guinea, Liberia, and Sierra Leone, three of the poorest countries in the world. Liberia is ranked 179 on the UN Human Development Index, with an average life expectancy of 56.11; Guinea is ranked 175, with a life expectancy of 60.6, while Sierra Leone is at rock bottom, at 183, with a life expectancy of 45.56. All these countries have been ravaged by war and conflict, and are amongst the most corrupt in the world. Poverty is widespread, communication is limited; borders are not just porous, but practically non-existent. Many people live in remote small communities completely out of touch with everything. One unsettling feature of the current outbreak lies in the fact that Ebola has also taken root in some large cities, where it is much harder to identify and eradicate. Because there is little faith in the thoroughly discredited public institutions, any government-declared Ebola emergency is often taken with a grain of salt. Even those health workers who commit to the fight against Ebola frequently lack the most basic forms of protection–unsurprisingly, about 100 health workers have already died. The surviving health professionals live with the knowledge that their commitment can lead to a nasty death, with whose symptoms they are all too familiar. Laboratory workers and other support staff are reluctant to have contact with blood, urine and stool samples, out of fear of the consequences. The WHO will initially focus on sending in teams of well-equipped infectious disease specialists who, notwithstanding their expertise, will nevertheless be functioning in a less than optimal environment. One WHO doctor already in Africa confessed that he had to overcome resistance from his wife when he responded to a call for volunteers. The WHO’s declaration of a “public health emergency of international concern” now authorises it to intervene in the affected countries, to support and strengthen their capacity to respond to this crisis, due to the "serious and unusual nature of the outbreak and the potential for further international spread". Reputable non-governmental organisations such as Medecins Sans Frontieres have criticised the slow international response, saying that the virus is “out of control”. It is not generally understood that the WHO's declaration empowers it to intervene directly in each of the African countries involved in the outbreak, requiring relevant local authorities to actively cooperate with it. The degree of chaos and confusion reported by reliable non-governmental organisations suggests that even the WHO’s man on the ground in the region is either out of touch or is being economical with the truth. Only a major concerted intervention by large numbers of well-qualified and well-equipped outside experts can hope to keep the lid on this cauldron of toxic uncertainty. Even if such an intervention is forthcoming, and quickly, it may be too late. The primordial western terror of Ebola is best exemplified by the current furious debate in the US, with some claiming that the Centres for Disease Control (CDC) acted irresponsibly when inviting infected US doctors back to the US for high quality care, allegedly exposing the entire population of the west to a possible outbreak. Because the west has until now perceived Ebola as an African infection, it has been reluctant to fund research into an Ebola vaccine. Now that Ebola could possibly morph into a worldwide pandemic, the west is coming up with considerable resources, to contain the outbreak and to produce a vaccine. If the rigorous standard procedures for testing such vaccines continue to be applied, it could take two years before a vaccine is available. If an Ebola outbreak has by then escaped Africa and has established itself outside Africa, including in the west, demand for the vaccine would vastly exceed supply. The company selected to produce the vaccine would take full advantage of this situation, driving prices and profits through the roof. The weak would go to the wall, unvaccinated, while the powerful immunised themselves. It can take as long as 21 days for identifiable Ebola symptoms to develop. The latency period normally lasts about 6-10 days. During this period Ebola is normally indistinguishable from the flu. Ebola becomes infectious only when its first symptoms have developed. And the earliest symptoms of Ebola–very high temperature, vomiting, and diarrhea–are not exactly confined to Ebola. This is when there is a considerable risk of infection and contamination. If Ebola spreads to the west, with its large anonymous conurbations, it would be difficult to control. In the absence of a vaccine, the probability of deaths would increase greatly. At this stage, western media are filled with uninformed chatter about vaccines and serums. Several companies have been working to develop an Ebola vaccine, but in the US, where most of this research is concentrated, most have been denied funding by the National Institutes of Health (NIH). It is also true that the enormous cost of tests mandated by the FDA until now, sometimes running into hundreds of millions of dollars, has been a significant factor in pharmaceutical companies’ reluctance to test new vaccines. The FDA is now under pressure to review or even to abandon this policy in relation to Ebola. It has emerged that much of the funding for Ebola research has aimed, not at protecting Africans and others from highly infectious tropical diseases, but at protecting western governments from the possible deliberate use of biological agents by non-state entities, or terrorists. Funding that is unavailable for public health purposes is suddenly miraculously available for national security. Since 11 September, western governments have been fiercely lobbied by pharmaceutical companies which, out of naked self-interest, have raised alarm in high places by hyper-inflating the threat to the west from biological agents in the hands of terrorist groups. This alarm, with its far-reaching economic and health consequences, has been concealed from the general public. For example, a UK company called Acambis persuaded governments of a serious risk that smallpox might be deliberately used by terrorists. Acambis went one step further, convincing many governments that they had to prepare for mass vaccination if they wanted to protect their populations. The fact that a much cheaper policy of containment had helped WHO eradicate smallpox from Africa was conveniently overlooked. Acambis invested a lot of money in lobbying senior public health officials. Enormous quantities of smallpox vaccine were ordered by gullible governments on the advice of these senior public health officials, as Acambis shareholders laughed all the way to the stock exchange, and Acambis was eventually sold to a US company for a fancy price. Since the smallpox vaccine has a limited life expectancy, those governments that bought it were also committing to replace their stocks at regular intervals. It was money for jam. Governments may have been hoodwinked into spending many hundreds of millions of dollars on a public health fiction devised by the public relations representatives of immensely profitable pharmaceutical companies. Although today’s terrorist organisations are much better funded and organised than their counterparts in the aftermath of 9/11, it can be contended that terrorist use of biological agents is unlikely in the present environment. Biological agents are very blunt instruments at best. Once released and dispersed, they cannot be confined to enemy populations, and can spread like wildfire. It is quite possible that they may eventually come back to bite the very organisations which released them, medically and politically. Moreover, since the war in Syria, we know that terrorist groups can now produce chemical weapons, which are strategically much more promising than biological agents. They can be targeted at specific areas and populations, and their capacity to generate fear and terror is undiminished. Various US and Canadian private companies and institutions have worked to develop an Ebola vaccine, but have so far been denied the NIH funding which, in the US, is the precondition for phase one trials on human beings. Excited at the possibility of an international move to enhance preparedness for this outbreak of Ebola, pharmaceutical companies will already be lobbying senior public health officials to secure a contract to develop and produce an Ebola vaccine. Given growing international concern about a possible international Ebola pandemic, the sky will be the limit for the companies cutting each other’s throats for this plum contract. US observers recently pointed out that, “right now, more money goes into fighting baldness and erectile dysfunction than hemorrhagic fevers like dengue or Ebola.” A table of global pharmaceutical spending in 2013 shows that “neglected diseases” including Ebola received almost no funding. Dr Margaret Chan’s heartfelt plea went unnoticed outside of the World Health Assembly, like previous pleas of this kind. The time has come for the BRICS governments, which collectively wield considerable economic power, to demonstrate their commitment to the developing world by establishing a well-endowed fund whose aim is, in consultation with WHO and relevant centres of expertise for infectious diseases, to stimulate research into and development of effective and inexpensive vaccines and treatments for infectious diseases afflicting the population of developing countries. They would fund the development of independent research institutes and production facilities to produce vaccines and medicines for sale to poor countries at below cost, and to developed countries for two or three times the cost price. This would go some way towards rectifying the historical imbalance between developing and developed worlds in this regard. It would also enormously strengthen the political/economic relationship between BRICS states and developing countries.